My last post was from Riyadh about 3 months ago. And I am here again. Looks like my blogging is stuck with Riyadh! Well this time it looks more familiar. Looks like I am beginning to understand this place better. Know where to get the right food. Know what to do and what not to do. And no Indian flags around this time 🙂 . Anyone who has stayed in Delhi and around (or most of north India for that matter) is perfectly suited for the weather here right now. It is actually 41-42 degree Celsius over here, a good 3-4 degrees lesser than Delhi! Being in a desert, I didn’t expect this. I wonder if the northern India is gonna be a desert in a few hundred years (and Saudi will transition into a green place). Who knows. This project will require frequent travelling to Saudi Arabia so I got a local SIM. I now realize that it is indeed true that telecommunication is one of the cheapest(if not the cheapest, which I think it is) out there in India. By the time this project gets executed I would have traveled to more than 15 cities! The first one on the list is Madinah! Guess what? There is only *one hotel* in Madinah which allows non-Muslims to stay! And there is a line of divide beyond which only Muslims can go! I am sure this is going to be interesting. Thanks to the people who (still) read my blog!!!! I decided to celebrate this Holi in Riyadh. Well, not really. But that is how it is. I somehow landed up here. So what did I expect to see here? Actually no expectations. I did not realize that I am headed off to a desert until the plane touched the King Khalid International Airport @ Riyadh. You immediately notice the dryness and the desert. The airport was quite deserted, like the surroundings. Surprisingly, very few airport staff. The immigration counters were also deserted. I had to wait for sometime before I noticed a few people coming up to the counters. Since there were too many people in the general queue, I took a chance and got onto the Diplomats queue behind a few ‘smarter-looking’ people. To my surprise, I was cleared off the immigration formalities without being asked anything. So far so good. I claimed my luggage which was lying off the conveyor belts and went for an additional luggage scan. Again the guy monitoring the scans seemed to be extremely cooperative and carefree. I just took my luggage and came out of the airport. I got onto the taxi and once the taxi was out of the airport, the infrastructure looked as good as any other city in the world. I bet, in Riyadh, if you stay for a couple of days, you will notice all great cars under the sun. So while we were cruising along the highway into the city, for a moment, I though I saw the Indian flag. I knew that couldn’t be the case. And again! I saw an Indian flag. And again! I didn’t believe. 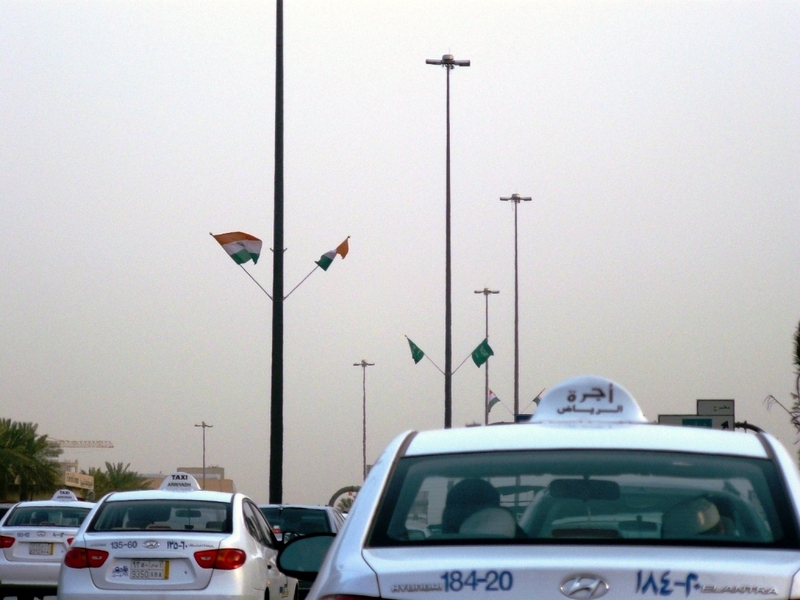 To my surprise, the Indian and Saudi flags were hoisted alternatively along the roadway into the entire city. What was going on? Was my visit so important? Kidding. But it was something I couldn’t comprehend. It was yesterday when I read the news that our beloved Prime Minister is here on a historic visit. And guess what, King Abdullah gave an unprecedented welcome to our Prime Minister along with his entire family. And the people here say, that this is, by far, the most warm welcome anyone has ever received by the King himself. Good times to be in :-). More about Riyadh and SA later. “Lansdowne is the one of the closest hill station from Delhi, just 260 kms away. Unspoilt nature, bracing air and a magnificent view of the snow-covered peaks inspire peace and tranquility. If you dream of the romance of the mountains then Lansdowne is the perfect place. Surrounded with the world’s highest and most beautiful mountain ranges – the Himalayas, naturally Uttaranchal Hills are endowed with extraordinary beauty and most of it is unseen in the outside world. This makes Lansdowne an ideal location for eco-tourism. A clean fresh and invigorating environment makes Lansdowne a preferred destination to relax and unwind and it is a truly rejuvenating experience. Lansdowne was originally a popular hill station with the Britishers. Attracted by its salubrious climate and natural beauty, they established a cantonment here. It was founded by Lord Lansdowne in 1887 A.D., thus the place has been named after him. The famous Garhwal Rifles of the Indian Army also has its command office here. The route is very simple. Delhi-Meerut-Bijnor-Najibabad-Kotdwar-Dugadda-Lansdowne. After reaching Begum pul in Meerut, take a right turn to Bijnor, state highway starts from here. From Kotdwar, the hilly drive starts for around 45 km. After 30 km uphill once you reach Dugadda, the journey becomes more beautiful and views more breathtaking and memorable. You will be literally driving in Pine forests. Nearest railway station is Kotdwar. Trains are easily available from Delhi. The best option is to take Mussoorie exp. from Delhi at around 2300 hrs, it will drop you to Kotdwar at around 0600 hrs in morning. From there, you can hire a cab for 400-500 rupees to Lansdowne, just a two-hour journey. There are amazing mountain views of the Western Himalayas from a number of vantage points in Lansdowne like Snow View and Tiffin Top. Like other hill stations in north India, Lansdowne too has its fair share of temples and shrines, most of them devoted to the various forms of the Mother Goddess. While you are in Lansdowne, make a wish at Jwalpa Devi, 47 km from Lansdowne on the Pauri-Kotdwar Road, or visit the Durga Devi temple (24 km from Lansdowne) and the Tarkeshwar Mahadev (30 km) with its special Shivlinga. This temple is one of the oldest Sidhpeeths in India. Light woolen clothing for summer and heavy woolen garments for winter. Carry rain protection gear in all seasons. I stayed at Fairydale resort. The location and ambiance is superb. Rooms are decent, however, a bit damp. Food was nice. Hospitality was great. It was not very expensive. The overall experience was good and I would recommend it. While the above should serve as a guide to plan a trip, I would highly recommend one to consider Lansdowne for a cool and relaxing break. What I loved was the drive from Kotdwar to Lansdowne. I witnessed all types of weather in a couple of hours! Sunshine, rains, fog, clouds, mist…you name it and it is highly likely that you will encounter all of this during the visit. Most importantly Lansdowne is not yet commercialized. There is a very relaxing aura about the place. It feels untouched, unexplored. You are bound to forget the everyday work hassles. I didn’t go for any activities like trekking etc. Still I could appreciate the place. Interestingly my mobile connection (Vodafone) didn’t seem to work there! It was a pleasant change not to receive any calls and SMSes for a couple of days! I realized how intruding mobiles have become to us. Airtel works intermittently. Not sure if anything else works over there. So be prepared for this. Also, there is no fuel station at Lansdowne! So if you are driving down, ensure that you get your vehicle refueled at Kotdwar. In case you run out of fuel, ask for ‘Chakki ki dukan’ in the ‘market’ at Landowne. You can buy petrol/diesel at a premium (not sure about the purity). However, try to avoid this at all costs. Once again, apart from the stay at Lansdowne, what was so refreshing was the drive to and around the place. It was just out of the world. The only thing which was a bit irritating was a landslide which held us back for about 4 hours while returning. On the positive side, that gave me an opportunity to capture some breathtaking surroundings through my new camera. “A picture is worth a thousand words.” Lansdowne is a photographer’s delight. Look for some of the ones I captured over here.